Official housing agent for the meeting is The Meeting Planners. The meeting is not any way connected to any other housing agents. Please decline any contact from housing providers claiming to act on behalf of meeting or The Meeting Planners. A block reservation has been made at the venue hotel and 2 nearby hotels from September 5th - 8th, 2018. At Hotel Scandic Copenhagen hotel, all 18 floors has new, modern and inspiring interior. This is also one of Copenhagen's largest conference centres with facilities including an extensive range of modern AV and IT equipment. 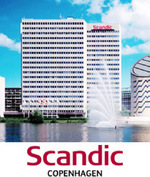 Copenhagen's attractions are right on your doorstep when you stay at Hotel Scandic Copenhagen hotel. Tivoli amusement park, Nyhavn and Stroeget shopping street are all within walking distance of the hotel. Includes sauna and fitness centre acces. CABINN Scandinavia Hotel is located in the peaceful borough of Frederiksberg, close to the lakes and just a short walk from Town Hall Square, Strøget and Tivoli. Just around the corner, you will find the popular Forum concert venue and the Forum metro station. The hotel has a large carpark so you don’t have to worry about your car. Newly renovated Comfort Hotel Vesterbro is with it´s 4-star interior and service a great value hotel on Vesterbrogade in the heart of downtown Copenhagen. Very close to Copenhagen Central Station and Tivoli and surrounded by the city's many shops and restaurants. All rooms are bright and decorated in an elegant style with parquet flooring and furniture made in Spanish cherry Wood. Cancellation/change of hotel booking: Before July 1st a fee of DKK 250 per hotelroom plus creditcard fee will be deducted. After this date no refunds can be made.